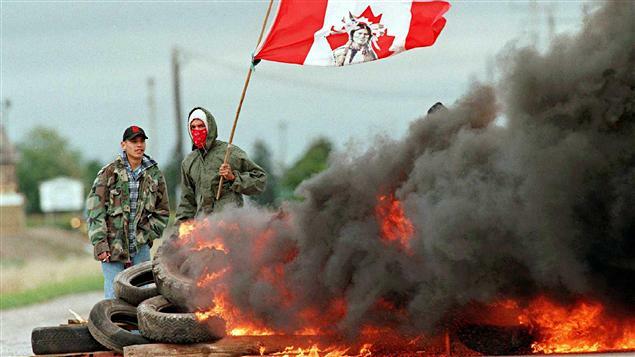 Blockade of highway near Ipperwash, Ontario, 1995, after the shooting death of Dudley George by Ontario Provincial Police. A bitter and bloody land dispute between Ottawa and a southwestern Ontario First Nation that culminated in the police killing of an aboriginal protester two decades ago has formally come to an end. The day after he was engulfed in flames during a demonstration at Stony Point, Pierre George joked he was “a little crispy,” but otherwise feeling well. “I just got burns on my hands and my eyes, skin coming off . . . and (the fire) burnt my mohawk,” said George, reached Monday by phone in a Sarnia hospital where he was recovering in the intensive care unit. Pierre George engulfed in flames during conflict at Stony Point (Ipperwash), Ontario. Photo: London Free Press. 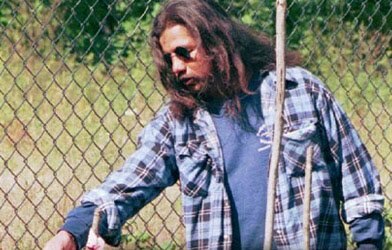 The brother of an aboriginal protester shot dead by police 20 years ago has been injured while protesting a settlement deal for lands in southwestern Ontario that were appropriated by the federal government during the Second World War. 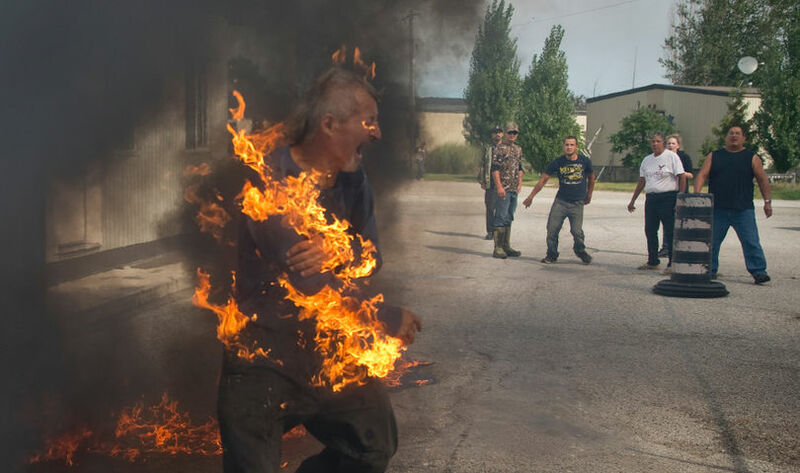 Witnesses say Pierre George was injured when he accidentally set himself ablaze while pouring gasoline on a fire that had been set by the protesters to get the attention of people marching to celebrate the return of Camp Ipperwash. There was no immediate word on his condition. Blockade of highway near Ipperwash, Ontario, September 1995, after the shooting death of Dudley George by Ontario Provincial Police. SARNIA, Ont. 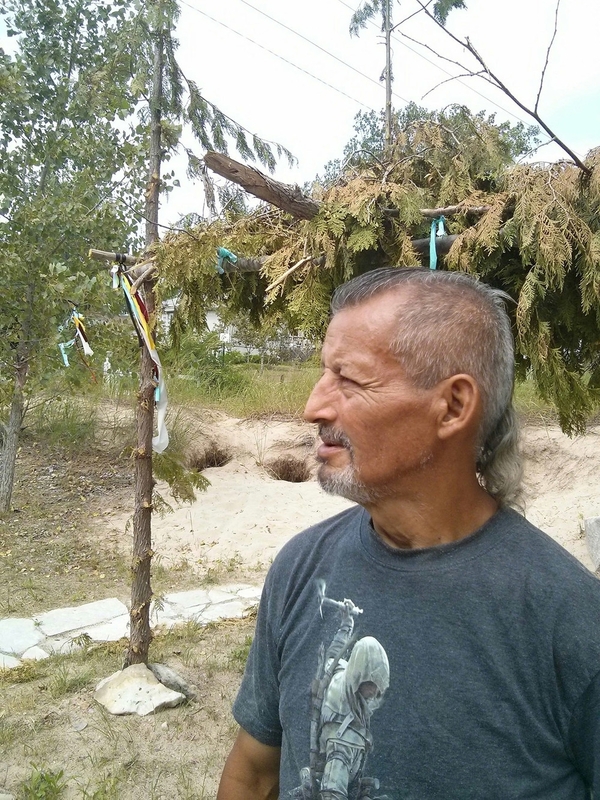 — A southwestern Ontario First Nation says it has ratified an agreement in the dispute over Camp Ipperwash, which saw the death of aboriginal protester Dudley George in 1995. In a release Saturday, the Chippewas of Kettle and Stony Point First Nation said eligible voting members approved the deal with the federal government in a vote held on Friday. The First Nation says the agreement includes a financial settlement in excess of $90 million, the return of land appropriated by the federal government in 1942 under the War Measures Act and cleanup of Stony Point lands. SARNIA, Ont. — Almost 20 years after a deadly confrontation between natives and police at Ontario’s Ipperwash Provincial Park, the federal government is offering to pay a $95-million settlement and return Camp Ipperwash — a military training site adjacent to the park — to the natives from whom it was expropriated during the Second World War. Tractor from the Kettle and Stony Point band removes gate and signage along beach, Dec 2014. 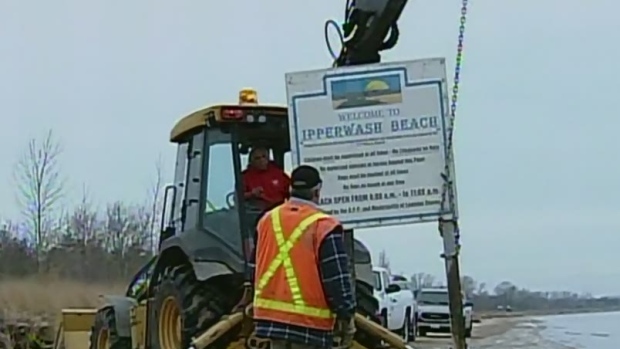 Cooler heads should prevail and upper levels of government must step in after a First Nation in southwestern Ontario tore down barriers and began driving along a stretch of beach near the site of the 1995 Ipperwash crisis, the local mayor said Sunday. A prominent human rights body meeting in Geneva is asking questions about the way police in Ontario respond to native land rights protests. 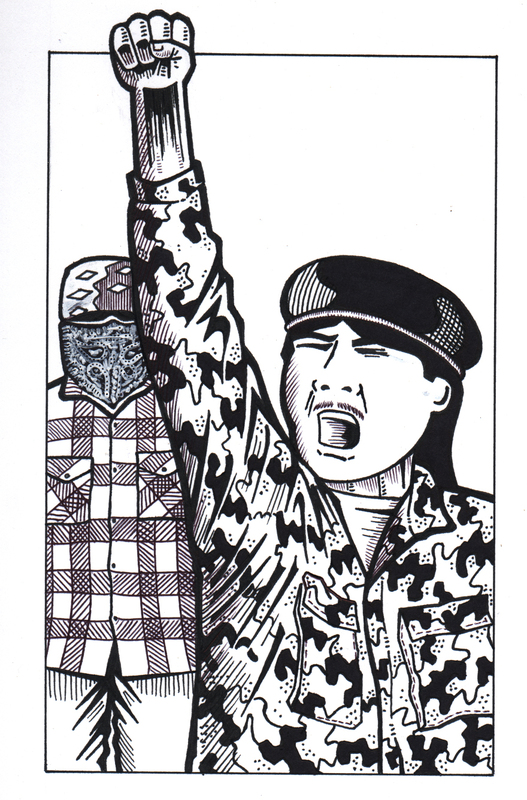 Graphic of Ipperwash protesters by Zig Zag.